On November 17 and 18, all twenty-one member economies of the Asia-Pacific Economic Cooperation (APEC) forum will convene for its annual summit. 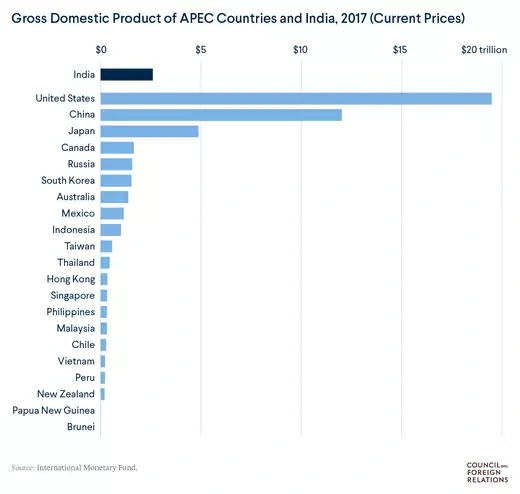 With the world’s three largest economies—the United States, China, and Japan—inside its tent, APEC has economic throw-weight on the world stage: the APEC economies account for 60 percent [PDF] of global gross domestic product (GDP) and 47 percent of global trade, according to the group’s statistics. However, a glaring omission is evident while tiny Papua New Guinea hosts this year’s event: India, Asia’s third-largest economy, is missing. Unlike other multilateral organizations that refer to their constituents as members, APEC focuses instead on its member economies. This is consistent with its official mission to “support sustainable economic growth and prosperity in the Asia-Pacific region.” While not a binding negotiating forum, APEC has led in creating initiatives to expand and enhance trade and economic connectivity. Examples include its early focus on trade facilitation and its championing of trade in environmental goods. 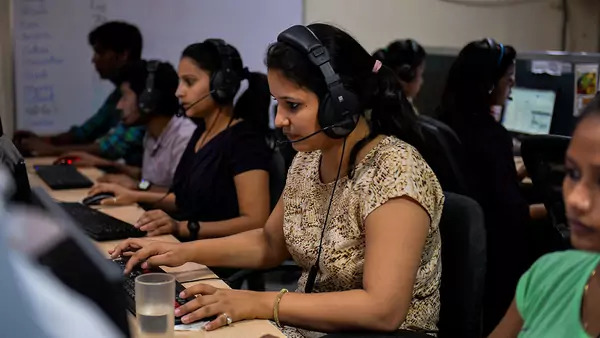 India’s $2.6 trillion economy is now one of the world’s largest, overtaking France this year to become the sixth-biggest economy at market exchange rates. It has liberalized—though it still has more to do on that front—and takes part in international trade and investment more than it had in 1989, the year of APEC’s inception. At that time, trade accounted for just 15 percent of India’s GDP, but that rose to 40 percent by 2017. India remains a tough negotiator on global trade matters and has shown a willingness to break consensus, but the scale of its economy more than merits a seat at the table in Asia’s top organization dedicated to trade and investment. It would likely benefit from being embedded among the rest of free-trade Asia and could use the peer support to reinforce voices for further liberalization. On the other hand, Papua New Guinea’s economy is the second-smallest in APEC—only Brunei is smaller—with an economy dependent on extractive industries, agriculture, and fishing. Moreover, it is not a likely model for digital connectivity and innovation, which are the theme topics for this year’s summit. These issues would be better covered were India, with its fast-growing digital economy, part of the discussions. Another measure of India’s relevance lies in its importance to the major global businesses that advise APEC. So important are the APEC economies to global trade and business that a nongovernmental body representing business—the fifty-nine-member APEC Business Advisory Council, or ABAC—has an official role in the organization’s ongoing program of meetings. One of the U.S.-based companies in the ABAC, global logistics behemoth UPS, lists fifty offices in India; it has one in Papua New Guinea. Papua New Guinea has been an APEC member economy since 1993, and its commitment to the forum’s principles of free and open trade and investment over the past twenty-five years deserves praise. But India has been knocking at the APEC door for more than twenty years. APEC has not admitted any new members since a membership moratorium expired in 2010; multiple explanations for the stasis include lack of consensus on new candidates, fears of disrupting consensus procedures, and concern for regional representation. In addition, expanding westward to include India would cast the forum’s geographic net beyond the Pacific Rim. But, in a way, that would mirror precisely the more inclusive Indo-Pacific regional framework first proposed by Japan and now in use in the United States and many other Asian countries. In recent years, numerous studies, including my own, have called for India to be admitted to APEC. India’s continued economic growth, its development as a trading nation, its own companies’ international expansion, its foreign policy focus on deepening ties with Asia—the Act East policy—and its participation, however difficult, in the Regional Comprehensive Economic Partnership trade negotiation all suggest that New Delhi will matter even more to the APEC member economies in the years to come.